Are you a gold digger? You know, the liquid kind. I absolutely am and if you are too, you are very familiar with how Velveeta can take an okay but rather boring dish to cheeselicious wow. Yes, it’s so awesome you just might start making up words. ;) At least that’s how we felt after making this awesomely fabulous Broccoli, Bacon and Potato Chowder with Cheese recipe! Over the weekend we had another chilly front set in sending the windows closed as temperatures dropped into the 40’s. It got me feeling like making one last big pot of soup before the warm weather is here for good. I was torn between of my 2 favorite soups that I actually hadn’t made all winter – broccoli cheese soup and loaded baked potato soup. With the boyfriend being no help, I decided what the heck, people put broccoli on baked potatoes all the time, why can’t I just combine the 2 flavors into one delicious pot of broccoli, bacon and potato chowder with cheese? Let me tell you, it totally works too! Whenever I think of a soup made with cheese, my mind always immediately goes to Velveeta. It’s just so smooth, creamy and delicious without the risk of being grainy. Why mess with a good thing, right? Not to mention you can use the leftover Velveeta to make a classic queso dip, casserole and so much more. Heads up – this recipe makes a ton! It seems to be impossible for me to make a small pot of soup, but it’s so good you’ll gobble it right on up in no time, especially if any of those fellow liquid gold diggers catch a whiff. If you’re not up for sharing or having leftovers, you’ll likely want to cut the recipe in half. This delicious and hearty chowder is sure to warm you up during the cold months. Optional toppings: Velveeta slices or shredded cheese, sour cream, chopped green onion, bacon, etc. In a large pot over medium heat, cook chopped bacon until crispy. Remove bacon with slotted spoon once cooked and set aside, reserving 2 - 3 Tablespoons of bacon grease in the pot. Cook onion for 2 - 3 minutes in bacon fat until slightly opaque. Stir in flour, coating the onions and allow to cook 1 - 2 minutes to cook out the flour taste. Slowly stir in the chicken broth/stock and bring to a boil over medium-high heat. Add potatoes and let cook about 10 minutes. Stir in broccoli and allow to cook for another 10-15 minutes until both broccoli and potatoes are fork tender. Turn heat back down to medium. If desired for a thicker chowder - in a large bowl, place several scoops (I used about 5 1-cup ladelfuls) of soup mix (including broth and veggies) and use an immersion blender or potato masher to puree ingredients to desired texture and then stir back into the pot. Stir in Velveeta and cream and allow to melt. Stir in reserved bacon, or use as garnish. Season with desired amount of garlic (I used about 1 teaspoon powdered), salt, pepper and cayenne if you like spice (I used about 1/4 teaspoon). 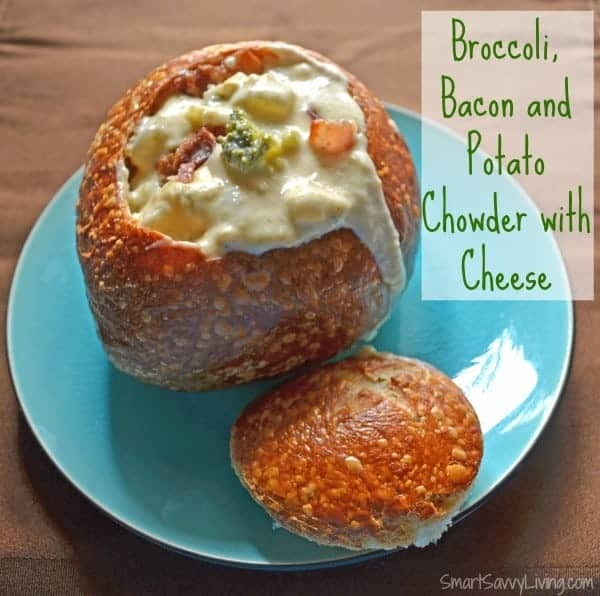 Serve in bowls or bread bowls and top with extra cheese, sour cream, green onion, bacon, etc. if desired. If you'd rather make a vegetarian version, bacon can be left out of this chowder and vegetable broth and non-dairy milk being used instead. Both the boyfriend and myself thought the flavor of this soup with spot on. There’s a lot going on, but none of the ingredients overpower each other. The broccoli provides a zip of color and crunch, while the bacon adds that yummy smokiness we all love, as the potato adds a touch of heartiness while the Velveeta pairs everything nicely together with its cheesy awesome powers. Are you a fellow liquid gold digger? What’s your favorite way to enjoy Velveeta? Velveeta asked me if I knew any Liquid Gold Diggers. I’ll know more soon once they taste these dishes! Why? Because Liquid Gold Diggers love the Liquid Gold of Velveeta. This look so yummy! I would love to make this for dinner. It is cool today and this sounds great.